Born and raised on the south side of Chicago, comedian-turned-actor DeRay Davis can most recently be "scene" starring opposite Taraji P. Henson’s “Cookie Lyons” as her go-to hitman/cousin “Jermel” in seasons 1 and 2 of the Lee Daniels and Danny Strong, creative collaboration, Empire on the FOX network. 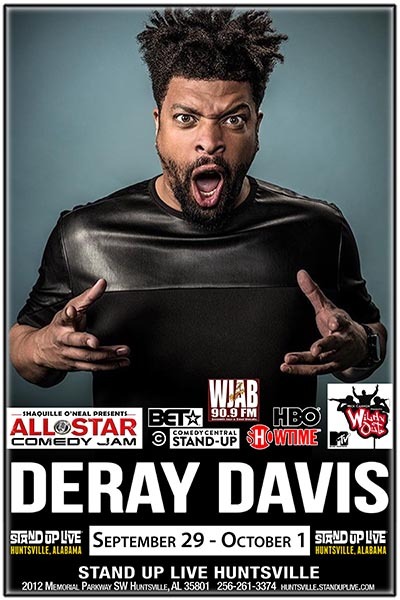 After his wildly successful 1 hour Showtime Comedy Special, DeRay Davis: Power Play that aired to rave reviews, Davis continues to ascend on what can only be described as the Samuel E. Jackson Formula; a path and pattern of consistent, feature film and network television roles! After his first, single card credit, as “Spooner” in John Carpenter’s remake of The Fog (2005), it has been eleven years (and counting) of back to back, prominently featured/starring roles in both film (32+) and television (50+) staring opposite Hollywood heavy hitters. License to Wed opposite John Krasinski, Semi-Pro opposite Will Ferrell, Imagine That opposite Eddie Murphy, Life As We Know It opposite Katherine Heigl, Old Dogs opposite Robin Williams & John Travolta, 21 Jump Street (2012) opposite Channing Tatum & Johnny Depp, G.I. Joe: Retaliation opposite Dwayne “The Rock” Johnson - just to name a few. Between takes, on the afore mentioned nationally released feature films, Davis continued to star and sometimes contribute as producer/writer in a steady stream of network television movies, mini-series, variety shows and sitcoms. One of DeRay’s first credited writer/ Voice Over roles was on Kanye West earlier Albums (and you thought that was Bernie Mac, didn’t you?) Davis contributed 5+ Voice Over Character roles on Multi Seasons of The Boondocks , Adult Swim’s Black Dynamite and continued sharpening his comedic craft by starring on almost every season of Nick Cannon’s Wild n Out from its conception to current airing on MTV as well as Hip-Hop Squares, Short Circuitz and Hosting the game show Mind of a Man on GSN. This led to his currently starring as Host on MTV2’s Joking Off currently in its second season (release date TBA)! Davis transformed his torridly rough upbringing, status as a working actor and fatherhood into a live show that stays fresh and ever changing according to whatever is happening in his daily life while he continues to develop and hone his streetwise mentality smoothly and efficiently onto the comedy-club circuit. He achieved his career breakthrough at the Laffapalooza Festival in Atlanta, GA, and then scored a 3-peat by winning the Comedy Central Laugh Riots Competition and landing covetable spots in the Montreal Just for Laughs Festival as well as the Budweiser Def Comedy Jam Competition. From the Hood to Hollywood – nothing is off limits and no one is safe from DeRay’s hilarious, sidesplitting anecdotes. He continues to sell out venues both domestically and internationally. His highly anticipated 1st ever Netflix special “DeRay Davis: How to Act Black” smashed the cultural landscape on November 14, 2017 and was so popular it shut down the Netflix server TWICE! Davis is continuing to ascend. He can currently be seen on the FX hit, Snowfall.